This term we are running an Introduction to Programming for students in Upper Primary. 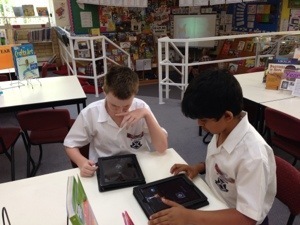 We are looking at a variety of apps (initially) in order to identify prior knowledge and to consider what is possible. The free apps are excellent for developing programming concepts with younger students. The apps below (some come with in-app upgrades) were selected as they build on each other, don’t take long to learn and set the scene well. As a part of this course students will consider WHAT that actually wish to do. To support this the Introduction to Programming Moodle course has tutorials and guides so students can be self-directed in their learning. journey. Students have the opportunity to access these resources outside of school time and to share and collaborate about what they are learning and doing with others via the Edmodo Programming group. Students will also reflect and complete a GOAL SETTING sheet to clarify their thinking and give some direction to their inquiry. Build their own app using a platform such as Blippit or iTouch App after you have created your book using Creative Book Builder. Creative Book Builder for CBB from Digital Roadtrip on Vimeo. As these sessions are purely to expose the students to programming and creativity through this medium, I am looking forward to seeing what the students create and what they are interested in, to develop resources and future sessions.